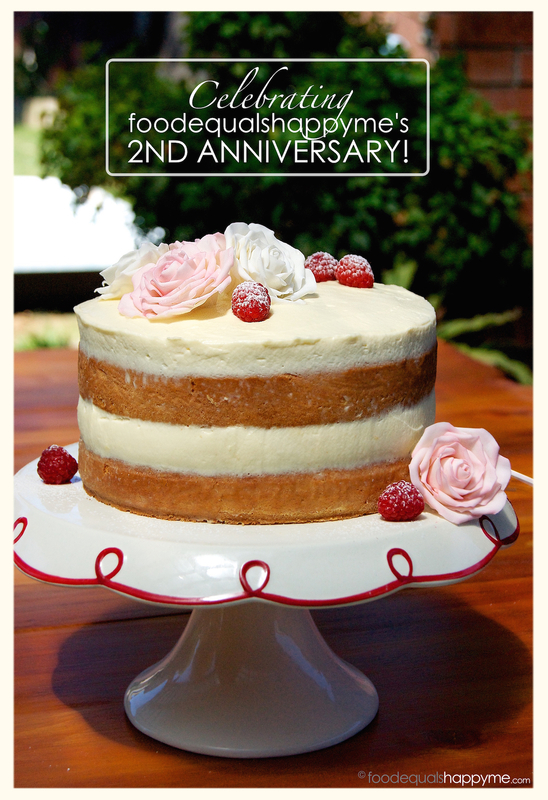 It’s 2015 and I’m back for another year, celebrating a belated 2nd anniversary of foodequalshappyme with a classic sponge cake filled with fresh raspberries & mascarpone cream, and decorated with some beautiful sugar roses made by yours truly! First off I have to apologise for the extended hiatus. It all started with a holiday break back in Nov, followed by some computer issues when I returned, and then all of a sudden it was the busy festive season with no time to spare. So what happened over the break? Well foodequalshappyme turned 2, that’s what happened. That’s right two years down, an array of things baked, and plenty more still to do! 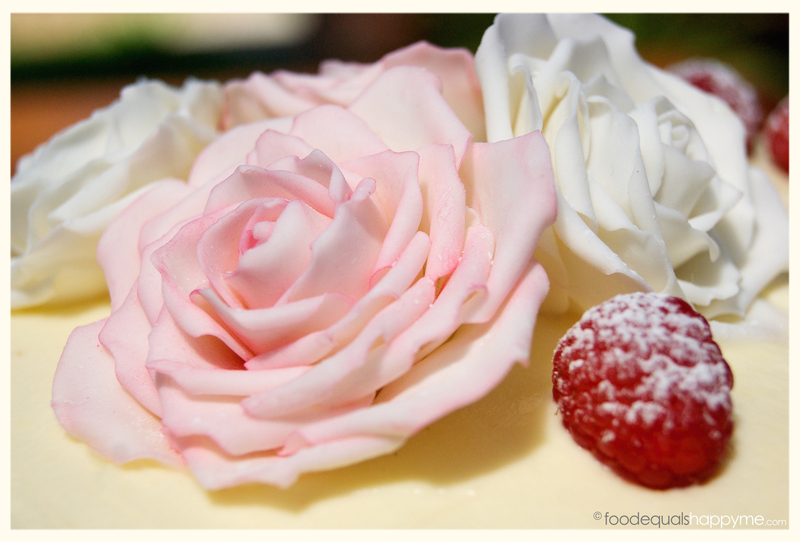 The first thing on my to do list for 2015 was to learn how to make sugar paste roses. I had so much fun creating this Gatsby Cake last year, that I decided I wanted to up the ante and give working with gum paste a try. I won’t go into detail for how to make them because I think you really need to see it and there are some great YouTube tutorials already out there. Suffice to say they are fiddly to make, but they are also very rewarding. I was pretty chuffed with how well they turned out, and how good they looked on this pretty sponge cake. A sponge is a truly magical thing, the fact that eggs can be simply whipped up into an amazingly thick fluffy mass is one of the great wonders of the kitchen. 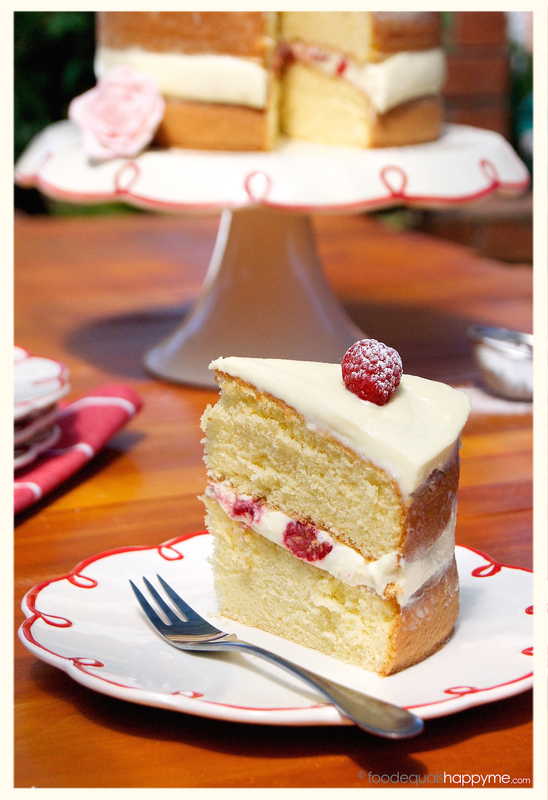 And you can’t get a better match for a delicate light sponge, than some fresh fruit and cream. 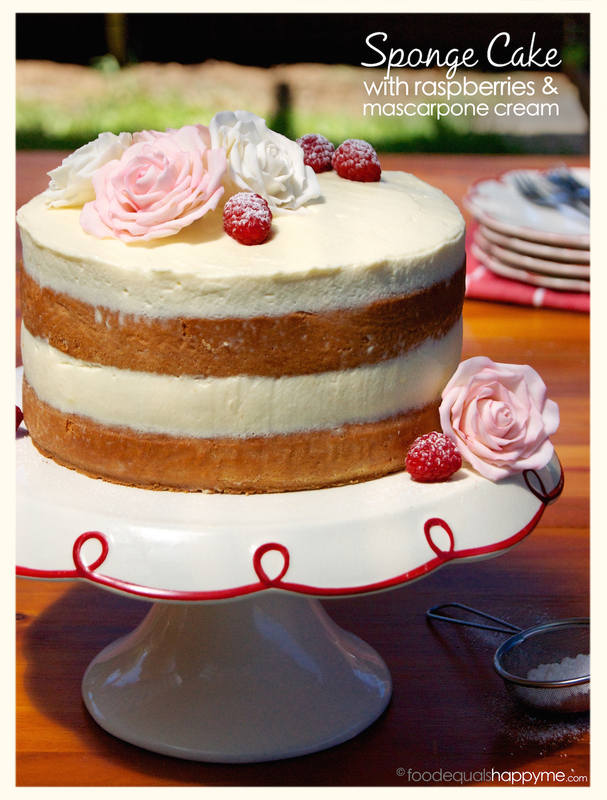 I like to add a slight twist to the traditional sponge, by using fresh summer raspberries and a mascarpone & cream mix. I really couldn’t think of a better way to kick off 2015. Preheat oven to 180 degrees c. Grease two 20cm tins with melted butter, line the base with baking paper, and dust the sides with flour. Melt the butter, and then set aside to cool. Place the eggs, sugar, and vanilla bean seeds in the bowl of an electric mixer, and whisk for 8-10 mins until light, fluffy and tripled in volume. Whilst the eggs are whisking, sift the flour three times. Check the butter before the eggs are finished, and if it’s still not cool enough then pop it in the fridge for 2mins whilst the eggs finish beating. Using a metal spoon fold the flour into the eggs in three batches, being careful not to knock out the air you’ve just whisked in. Lastly, fold in the cooled butter (it’s important that it’s cooled, otherwise it will just sink to the bottom). Evenly divide the mixture between the two prepared pans, and bake for 20-25mins or until the cakes have shrunk in at the sides and they spring back when pressed in the centre. Carefully remove from the tins and leave on wire racks to cool completely. To make the filling whisk the cream, icing sugar and vanilla in a bowl until soft peaks form. Place the mascarpone in a bowl and stir to loosen. Fold in a third of the cream mixture first, and then the remainder. To assemble the cake place one half on a serving plate and then top with half the cream mixture. 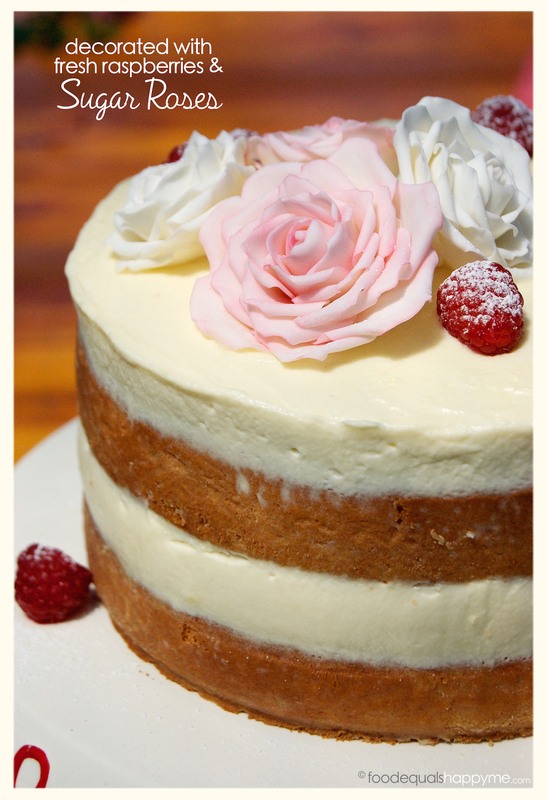 Top the cream with the fresh raspberries, reserving a few for decoration on top. Next place the second cake layer on top and spread with the remainder of the cream. 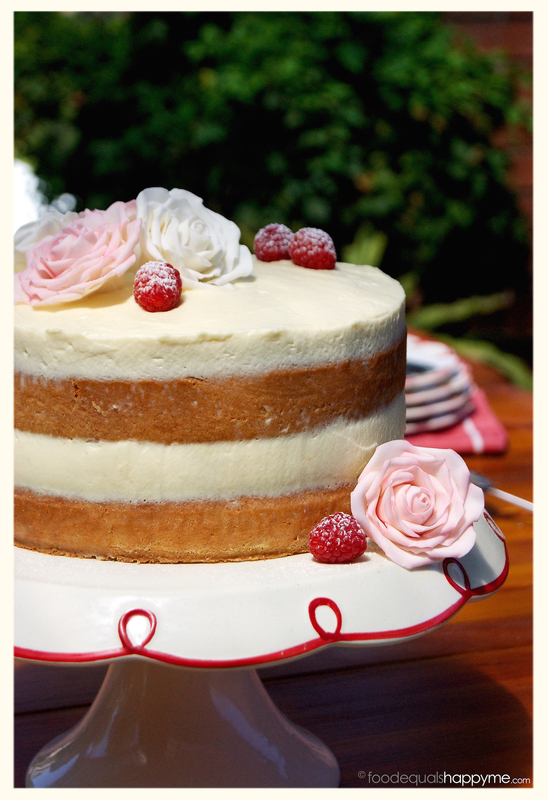 Decorate the top with a few fresh raspberries dusted with icing sugar. 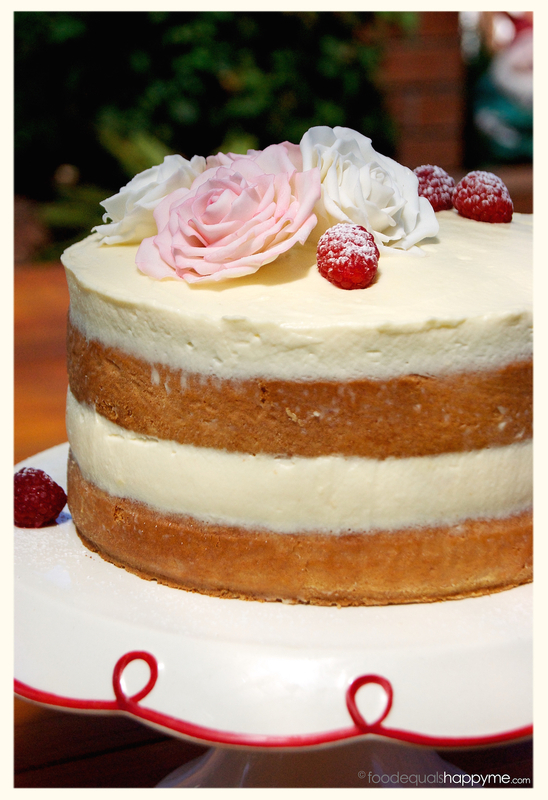 This cake is best enjoyed on the day it is baked. 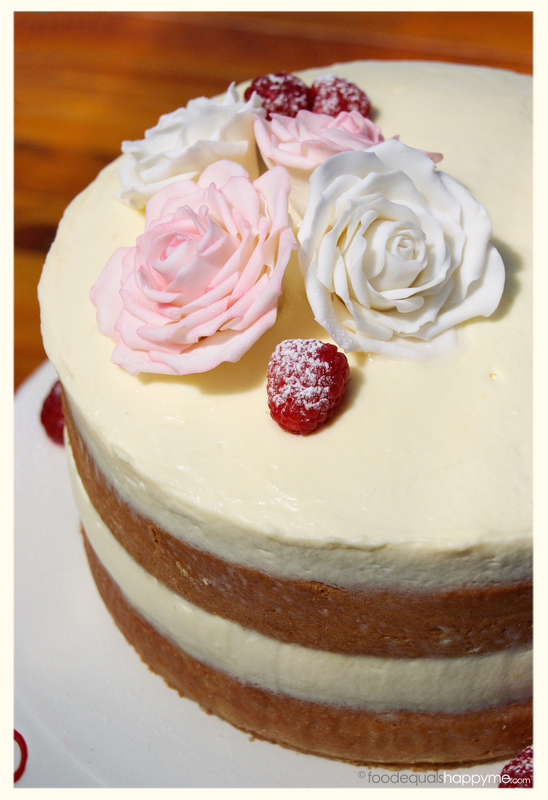 Wow, this cake looks and sounds amazing – the detail and sugar roses! This looks so pretty!!! The roses are so gorgeous! Bet its just as tasty!